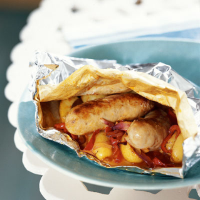 Impress your family with these foil-wrapped parcels of sausages, peppers and potatoes, cooked in their own juices to create a delicious sauce. Preheat the oven to 200°C, gas mark 6. Place the potatoes in a medium pan of cold water, bring to the boil and simmer for 10 minutes until just cooked but still firm. Drain and set aside. Meanwhile, heat a large frying pan over a medium heat, add 1 tablespoon of the oil and fry the sausages for 4-5 minutes, or until just browned. Remove from the pan. Add another tablespoon of oil to the pan and fry the peppers, red onion and garlic for 3 minutes, until starting to soften. Stir in the picante pimentón and season. Add the drained potatoes, stir to combine then remove from the heat and set aside. Line 4 squares of foil, each approximately 30cm square, with the same sized piece of baking parchment. Divide the potato and pepper mixture between the squares and top with 2 sausages per parcel. Drizzle with any juices from the pan. Fold the squares in half to form a parcel and turn in the edges to seal, leaving 1 edge open. Divide the wine or vegetable stock between the parcels then fold over the last edges to seal completely. Lift onto 2 baking sheets. Place in the oven for 30 minutes or until the sausages are cooked through. Serve in the bags with a green salad. Double the recipe and make 2 large parcels to feed a greater number of people. Ripe, supple and spicy Domaine la Colombette Grenache/Syrah, Vin de Pays des Coteaux du Libron (an April Wine of the Month), suits the spicy notes of this dish.